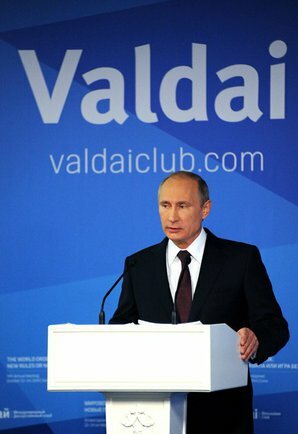 On 24 October 2014 President of Russia Vladimir Putin took part in the final plenary meeting of the Valdai International Discussion Club’s XI session. The meeting’s theme is The World Order: New Rules or a Game without Rules. I hope that these changes in organisation and content will bolster the club’s influence as a leading discussion and expert forum. At the same time, I hope the ‘Valdai spirit’ will remain - this free and open atmosphere and chance to express all manner of very different and frank opinions. Some are saying today that Russia is supposedly turning its back on Europe - such words were probably spoken already here too during the discussions - and is looking for new business partners, above all in Asia. Let me say that this is absolutely not the case. Our active policy in the Asian-Pacific region began not just yesterday and not in response to sanctions, but is a policy that we have been following for a good many years now. Like many other countries, including Western countries, we saw that Asia is playing an ever greater role in the world, in the economy and in politics, and there is simply no way we can afford to overlook these developments.